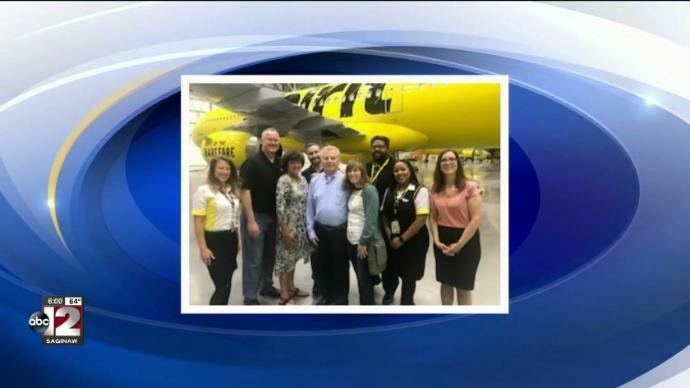 FLINT (WJRT) (06/27/18) - A nurse at McLaren Flint hospital helped save the life of a man in cardiac arrest aboard an airliner in Detroit. Katie Yombik was flying out of Detroit Metro Airport with her family, heading out on a vacation in March. Five rows behind her, a man slumped over in his seat. "All of a sudden, I heard someone say, 'Call 911,'" Yombik said. She sprung into action, quickly going back to the man's seat. He clearly wasn't breathing and was unresponsive. Some of the flight crew and another nurse on the plane helped Yombik moved the man out of his seat onto the floor. "Quickly felt for a pulse. Couldn't find a pulse, so I lifted his shirt up and started CPR," Yombik said. There was an AED on board the plane, which the flight crew quickly brought to help. "We continued CPR, put on the AED pads, it said shock advise, we shocked him, we continued CPR for maybe another 20 seconds and then we noticed he was starting to try to breathe on his own, " Yombik said. The man was taken off the plane and rushed to the hospital. "They cheered when we took him off, so it was a really good feeling, knowing that we were able to help him," Yombik said. "It turns out he had emergency surgery that same day and he's already back to work, I hear."